I’m so excited to share the cover of my new book with you! Mixed Media Portraits with Pam Carriker is now available on amazon for pre order and will be releases in March of 2015. Set your portraits apart from the rest! Portraits can be an intimidating subject. But not with Art At the Speed of Life author and workshop instructor Pam Carriker as your teacher. She helps you take on faces one quick sketch at a time for faster, easier, more enjoyable drawing and painting. 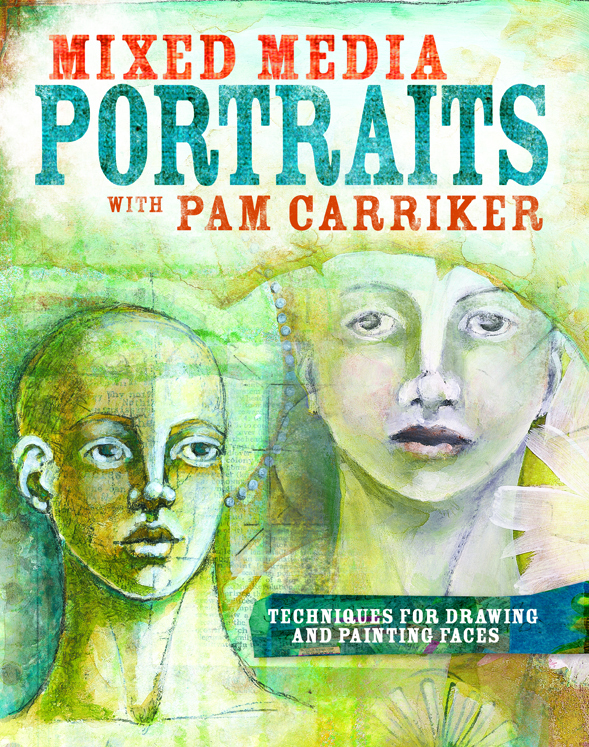 Not your average book on drawing the face, Mixed Media Portraits With Pam Carriker shows easy ways to draw more realistic faces in your own signature style. The goal is not an immaculate finished portrait, but a continually growing collection of personal, expressive sketches that you can use and reuse in your mixed-media work. In the true spirit of mixed media, this book is all about combining, layering and experimenting in your pursuit of portrait nirvana. It will get you out of your comfort zone and into the habit of making faces that are truly and uniquely your own. This book was a labor of love. I’ve spent the last few days going over the final author review and I’m so thankful to North Light for allowing me to create the book I envisioned. Can’t wait for the release of this book! I need lots of help with drawing faces so I avoid them. With this book, I can try again and be successful. I am so happy to see this. Your last 2 books were amazing and this one looks over the top! Of course, I love you both as a person, artist, teacher, which may make me a tad bit bias, but I think not! You are the real deal, Pam Carriker. Hi Pam, I just preordered your new book! I am looking forward to to walking through it and putting my new paints and inks to work. They arrived earlier in the week and are calling me to the art room. I haven’t openened them up yet, as I’m holding them as a reward for when I complete a couple of other projects. I’ll keep you posted when I begin to play!